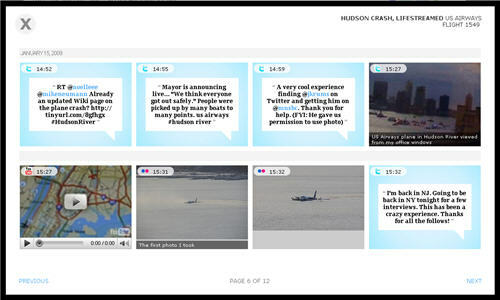 Last night Robert Scoble said that he wished he had created a room on FriendFeed so he could aggregate various data sources for the US Airways crash yesterday. Robert also wrote details about how the story broke on the real-time web today. I was also notified that a user created such an activity stream. The result is a remarkably nice visual account of the events by Kevin Sablan using the premier feature of the Storytlr service. To make the presentation, I used Twitter Search to find comments with the word “Hudson” from people within 50 miles of New York City. I waded through those comments to find a handful of people whose comments, pictures and video might work to tell a story. I imported the content from each of the sources into storytlr by simply providing their usernames. The hard part was editing, or what Tim Windsor calls curating, the approximately 700 bits of information into some semblance of a disjointed story. You can read the full details about the process on the post here. There is also a post on the Storytlr blog here. The idea of creating an activity stream around an event isn’t totally new. Several people have already been doing this using rooms on FriendFeed. Sarah Perez recently created the CES 2009 room where she provided coverage of keynotes and breaking news as it happened. I also wrote about the creation of one for the Ubuntu developer summit as well. Having a real-time dynamic activity stream for a live event is one of the best applications I have seen to date. I think we are going to see this become pretty commonplace this year as the value for creating one is huge. Mark, it was your post a couple days ago about Storytlr's new features that prompted me to try it out. After creating an experimental “story” I immediately started wondering about how it could be used for journalism, and hoped for an opportunity to present itself. Although the process wasn't painless, I probably couldn't have pulled it off in a few hours without Storytlr. And the exercise really brought to mind some enhancements that might make the system more conducive to this kind of editing. I'll pass those thoughts to Alard Weisscher over at Storytlr. Who knows, this might become the definitive tool to curate and present social media content from multiple sources. Thank you for bringing this tool to my attention, and for keeping my interest in lifestreaming in general. Whoa, I had no idea. That's gret Kevin. Glad I was able to bring Storytlr to your attention. I'm sure they're happy as well as you've now created a pretty compelling use of their primary feature. I look forward to hearing about any future ways you find to create a unique method to tell a story using aggregation.